A little advance planning goes a long way when it comes to dealing with tenants who bounce checks. Typically, landlords have the right to charge fees for bad checks — if it’s covered in the lease. Depending on your state law, that may mean a flat rate, or that fee may be limited to actual out-of-pocket costs like bank charges or time wasted dealing with the process. Charge only what your state allows. Anything more, and the fee becomes a “fine” — and that’s not enforceable. Make sure your policy covers any reason a check is rejected, and not just the ones that get rejected for insufficient funds. For example, the tenant could send a check but neglect to sign it. If you don’t catch it, your bank may reject the check and charge you a fee. You should make sure you have the right to pass that fee on to your tenant. The bad-check fee is not your only remedy when a check is returned. If your tenant is passing bad checks, you need to reserve the right to evict for non-payment if they don’t make good on the rent. Be sure that your check policy gives you the right to demand future rent payments in the form of a money order or cashier’s check. You don’t need to insist on this forever, but at least for several months. After experiencing the hassle of getting a cashier’s check every time rent is due, most tenants will make sure their next rent check goes through without a hitch. In addition to eviction, many states provide the right to sue over the bounced check. 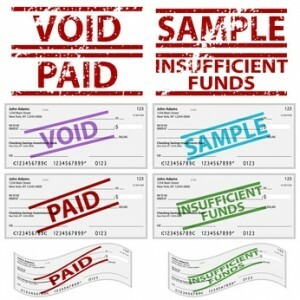 Often, the check holder can recover some combination of the face value of the check, other out-of-pocket costs, and a civil penalty — for instance, three times the face value. One very important point to remember: Be sure to apply any check policies uniformly for all tenants. Otherwise, you risk getting in trouble for discrimination. Next post: Would You Rent to This Tenant?